Are you ready to learn about football? Well, this blog post will tell you about football teams, scores and even includes a story I made! So take a seat and watch the game! There are 32 different teams in the NFL. NFL stands for National Football League. The teams are split into two parts, the AFC and the NFC. That is actually a division problem. 32 divided by 2 equals 16. So there are 16 teams in the AFC and 16 in the NFC. All teams have a stadium in a state. Two teams can have a stadium in the same state but just different stadiums in different places. For example, Texas has two stadiums. The Houston Texans have a stadium, and the Dallas Cowboys have a stadium in the same state, but just a different stadium location. In a game, one team starts with the ball and the other team defends. The team with the ball has four downs or turns with the ball. If they get the ball past an orange marker, the first down marker, with a pass or a run, then they have four more opportunities with the ball. A touchdown is 6 points plus if the kicker makes it in the field goal, 1 more point. Instead of kicking for 1 more point, the quarterback can signal ‘Go For Two’ where the referee can put the ball on the 2-yard line and the team has an extra play to try to get into the touchdown zone, or goal, for two extra points. If a team is on their 4th down in their opponent's territory, they can try to kick the ball into the field goal for 3 points. One day I was at a football game. The two teams were the Atlanta Falcons and the New England Patriots. My family and I got to the stadium in my mom’s shiny and white Toyota Sienna. We parked the car, unloaded a couple things, and my dad locked the car. The car went “Beep, beep!” as all cars do when they lock. When we entered the Patriots stadium, Gillette Stadium, I was so excited I felt like I was going to explode. We got into our seats and watched the start of the game. “Hike!” the quarterback yelled a few times. Late in the first quarter, the Patriots scored by running the ball. The fans went wild like a pack of wolves. “Yay! Great! Yeah!” was what I heard. The kicker made the field goal and the crowd cheered some more. In the start of the second quarter, the Falcons scored. There wasn’t much noise but I heard some faded wow’s and yeah’s In the crowd of people. They also made the field goal. The game was now tied, 7 to 7. “Sure!” He answered, and brought me to the food court. Man, was there ever such a great view from up there. My dad ordered a hamburger with dressing, lettuce, tomato, and an iced water. Write your own ending in the comments box! 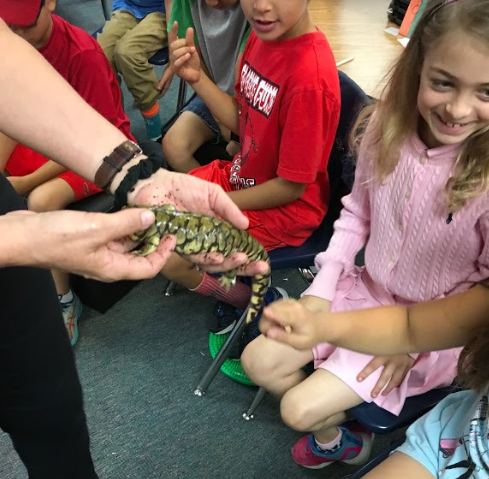 Science: Meet a Salamander, a Skunk, and an Owl! As part of our animal adaptation science unit, Beverly Critcher from Wildlife Experience brought three wild animals to Mrs. Yollis' class for careful scientific observation. She brought a salamandar, a striped skunk, and a great-horned owl. 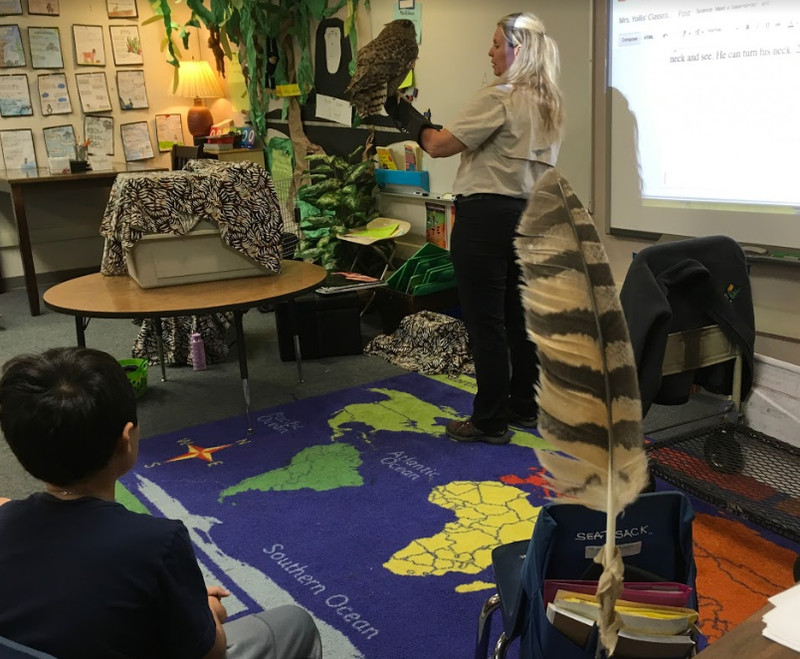 Wildlife Experience is a non-profit wildlife education organization that brings native and exotic animals to schools and teaches children about the importance of our natural world. 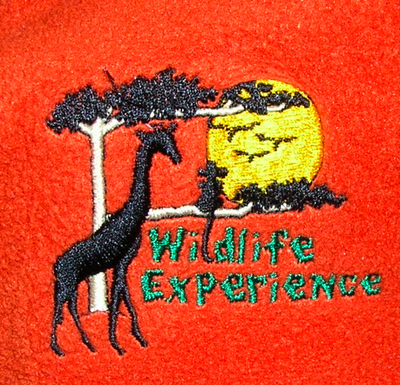 Here is Ms. C., the owner of Wildlife Experiences. 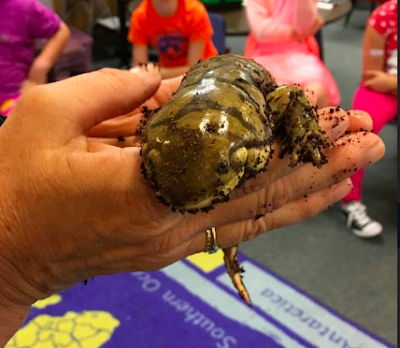 First, we met an amphibian named Sally the Salamandar. 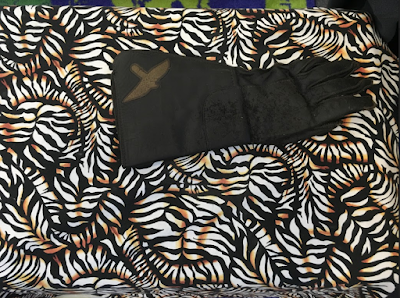 She is called a tiger salamandar because of the stripes on her body. Amphibians can breathe on land and in water. They have lungs, but also have tiny little holes called pores, on their skin. This physical adaptation allows them to breathe underwater. One physical adaptation she has is her large mouth. She can hunt for insects easily with this adaptation. She can even eat underwater! Sally the Salamander is twelve years old, and we got to touch her! How did her skin compare to the gopher snake? 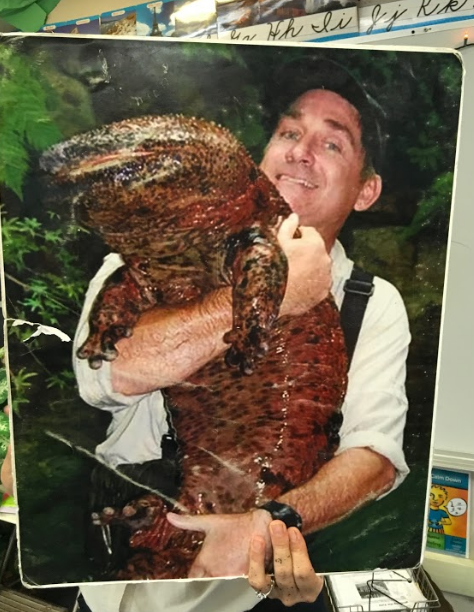 The Chinese giant salamander is the biggest salamander in the world! 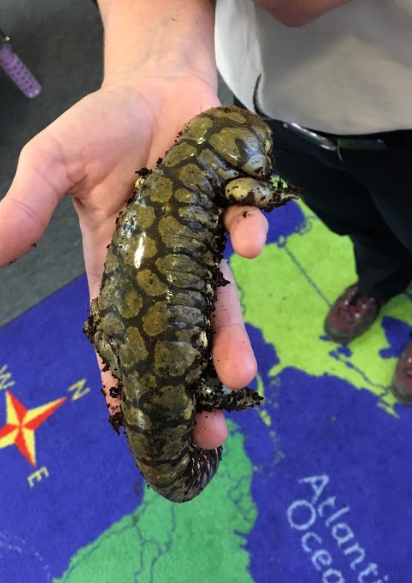 It can grow to be 5 1/2 feet long. Here is a photo! 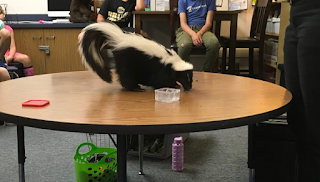 Next we got to meet Trouble, a striped skunk. We know what you're thinking. Skunks spray up to fifteen feet! How could you have one in your classroom? The answer, Trouble's scent gland has been removed. Here is a video of Trouble enjoying some snacks. What can you tell from her body language? Check out the teeth and claws! 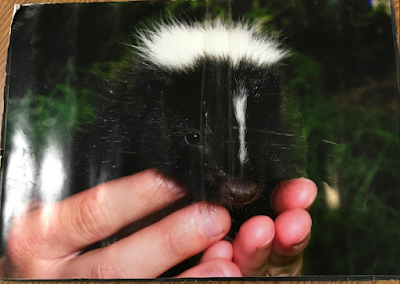 How do you know if a skunk is feeling anxious? Look for body language. If his tail curves up, the skunk is afraid. If his tail is down and flat, the mammal is calm. Skunks are omnivores, which means they eat plants and meat. Surprisingly, a skunk's favorite food is a black widow. They keep the black widow population down. Baby skunks are quite small. The final animal Ms. C. brought was a bird. Notice the glove she uses to bring out this wild animal. Behold! 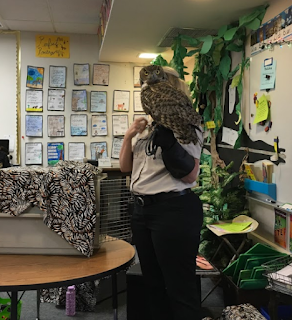 Ms. C. brought a great horned owl! These birds look like they have horns, but they are just tufts of feathers. We know we have great horned owls around our neighborhoods because Mrs. Yollis found this feather outside her door years ago. Look how it matches the tail feathers! Owls have asymmetrical hearing. One ear is up and one ear is lower on his head. The ear is a hole. The females are larger because they stay in the nest to defend. The males are the hunters. The smaller you are, the faster you can fly, the better hunter you will be. Owls hunt and kill with their feet, so Ms. C wears a glove. Talons, or claws, are used for grabbing and stabbing. Owls have eyes on the front of their heads. They need the adaptation to turn the neck and see. 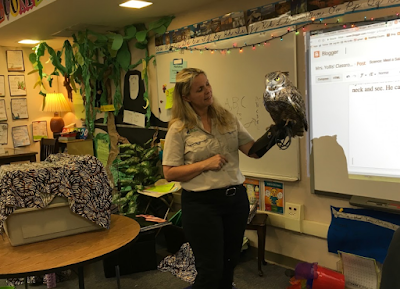 Owls can turn their necks 2/3 of the way around! What did you learn from Ms. C.? Use World Book Online to research facts to share. Remember, do not copy and paste! That's plagiarism! brought two wild animals to Mrs. Yollis' class for careful scientific observation. She brought a hedgehog and a gopher snake. Before we met the animals, we learned about a food chain. A food chain is basically the circle of life. It always starts with a plant, which means herbivores (plant eaters) are on the bottom of the food chain. Then a predator comes and eats that herbivore and gets all the energy. Then another animal comes and eats that animal and gets all the energy. Soon, we have an animal that no other animal eats. That animal is the top of the food chain. An animal that eats another animal is called a carnivore. Animals that eat plants and meat are called omnivores. When animals die, they decompose and make the soil nutritious, or better. That is the circle of life. 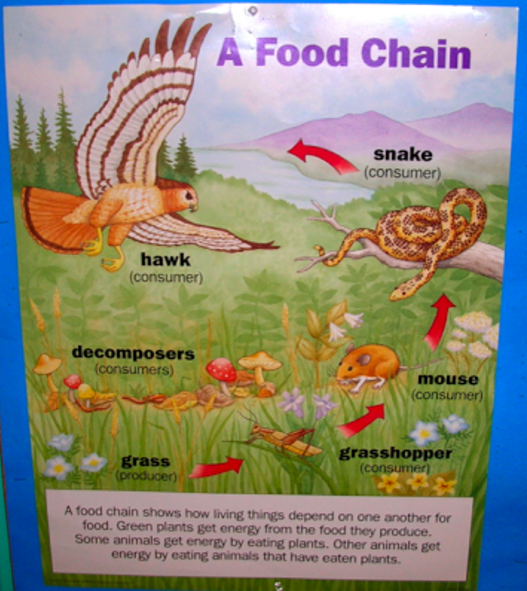 A food chain can be formed in any habitat of the world. For instance, there are food chains in the oceans, savannas, and rainforests. After the lesson on food chains, it was time to meet a hedgehog! Tucker, the hedgehog, is a cute fellow. 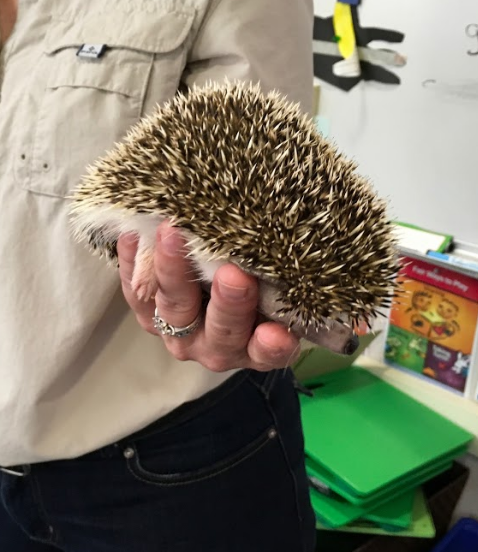 Hedgehogs and porcupines have quills that can really hurt. Tucker is three years old. Out in the wild, hedgehogs usually live for up to three years. In captivity, a hedgehog can live up to seven years. Of course, that is very rare, but it is possible. 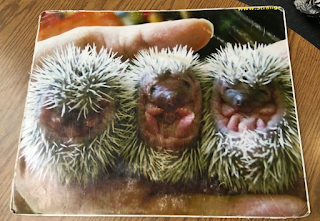 Here is a photo of some baby hedgehogs. Aren't they cute! See this short video of Tucker! Hedgehogs are mammals, but also considered as rodents. They are also insectivores. That means they eat a lot of bugs! Hedgehogs have really cool adaptations. First of all, they use their quills (physical adaptation) to protect themselves. 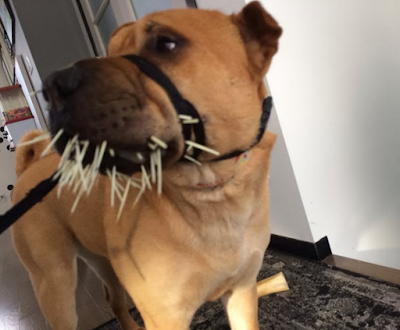 When the predator runs into the hedgehog, the predator gets the quills stuck into their face. The hedgehog backs up to make the quills go into the body even further. Ouch! But don't worry, the quills are made of the same thing as your hair and your nails, which is keratin. It grows back, just like you! When a hedgehog sees a predator coming, it curls up into a ball. That is called a behavioral adaptation. Can you guess which African animal is afraid of the porcupine? It is a big animal, a big type of cat. Do you know it yet? You might be surprised, but it is a lion! Can you believe that a big lion would be scared of such a tiny creature? When a lion gets quills in his face, they hurt. Look at this photo of Mr. Shareski's dog. How can you tell that Clementine was interested in a porcupine? Are hedgehogs and porcupines born with quills? YES, they are. They are soft, but they turn hard and become stiff and dangerous. Next Miss C brought out a reptile. We know that reptiles are cold-blooded, are vertebrates, and hatch from eggs. The reptile she brought was a gopher snake. Like all snakes, it has lungs, no eyelids, and smelled through his tongue. Watch it flick its forked tongue. Some snakes are venomous like the rattlesnake, cobra, or black mamba. When looking for a meal, they wait, strike, and wait some more. When the animal dies, the snake opens his mouth and swallows the prey whole. Constrictors are snakes that do not have poison. 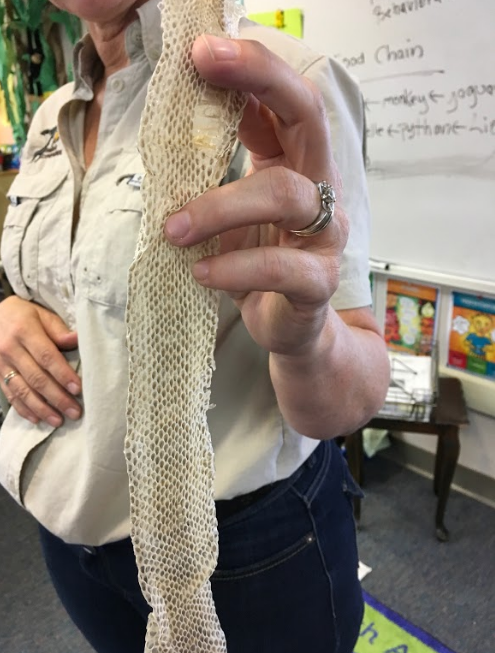 Some examples are king snakes, boas, and corn snakes. Constrictors squeeze their prey until it dies and then consume it. Ms. C showed us a gopher snake. 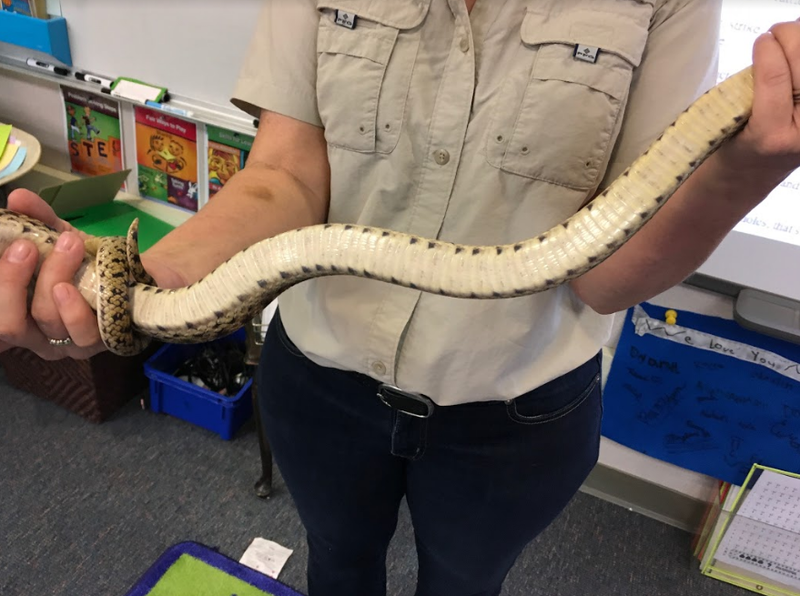 A gopher snake looks just like rattlesnakes, especially from a distance. 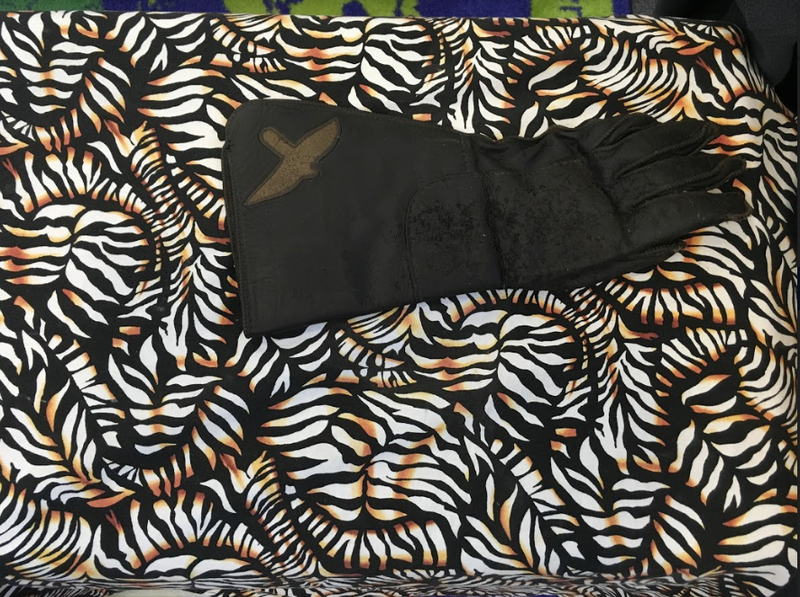 It has a body pattern that looks like a rattlesnake's, and it hopes that confusion will keep you away! It will shake the tail and the rustling will sound like a rattler. This behavioral adaptation might save its life. We got to touch the snake with two fingers. What did it feel like to you? As snakes grow, they shed in one long piece. Lizards shed in pieces and then eat the skin. This behavioral adaptation helps get rid of evidence. Lizards don't want predators to know they are around. Gopher snakes live up to 30 years in captivity. This snake is perhaps 24 years old. 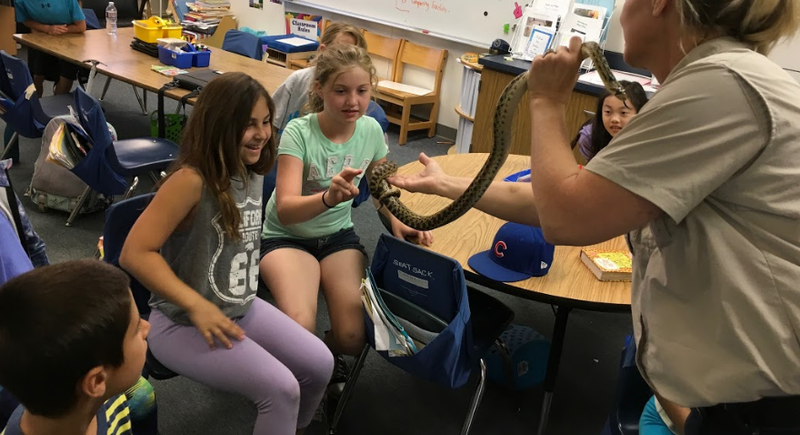 Why is the snake called a gopher snake? 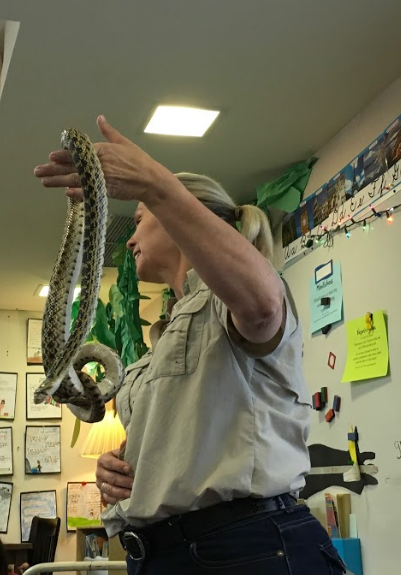 What does a gopher snake eat? Is it an herbivore, a carnivore, or an omnivore? What does a snake feel like? Why is the hedgehog born with soft quills? Research on Worldbook Online and share some new facts! 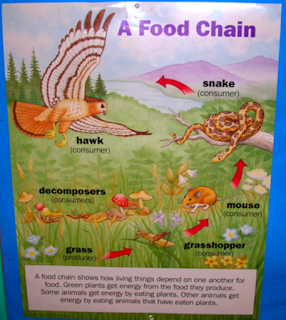 Give 3-6 animal food chain. Start with a plant.